Donald Trump promised big tax reform when he was on the campaign trail, and he released a preliminary outline of his plan during this first 100 days, but he has not introduced his formal plan until now. On Sept. 27, he introduced the Unified Tax Reform Framework, which included big tax cuts for individuals and businesses, as well as changes to other fundamental tax rules, including deductions and foreign tax reporting. Trump’s tax plan will cut taxes for individuals across the board, and it would cut the top tax rate to 35 percent. The plan also consolidates the number of tax brackets from seven to only three. The lowest tax bracket would have a tax rate of 12 percent, which is down from 15 percent. The middle tax bracket would have a tax rate of 25 percent, which is down from 28 percent. The top tax bracket would have a tax rate of 35 percent, which is down from 39.6 percent – the largest reduction among the tax brackets. The information released so far about the tax plan does not specify the income ranges for each tax bracket. However, the information Trump released put an income range of up to $37,500 for the lowest tax bracket, $37,500 to $112,500 for the middle tax bracket, and over $125,000 for the top tax bracket. The married income caps were $75,000, $225,000 and above, respectively. For each tax bracket, the plan introduced on the campaign trail would also change capital gains taxes to zero percent, 15 percent, and 20 percent, respectively. Itemized deductions would be eliminated for individuals, except for mortgage interest and charitable contributions. Deductions for retirement savings, which were included in earlier proposals, have also been eliminated. The plan also eliminates deductions for state and local taxes. To compensate for eliminating deductions, the Trump tax plan doubles the standard deduction. This would help some people but would hurt others. The standard deduction for single payers would rise from $6,300 to $12,000, and for married payers, it would rise from $12,700 to $24,000. The plan would hurt people with children. It now eliminates personal exemptions and allows for taxpayers to subtract $4,050 for each person in the home. That would result in higher taxes for those with multiple children. Trump’s plan also eliminates the estate tax, the generation-skipping transfer tax, and the alternative minimum tax. Cutting the first two taxes would cut $17 billion in revenues. People with children will get a bigger credit, but the plan does not specify how much it will be yet. The plan also increases the income level for those who can claim the child tax credit. The new Trump tax plan also allows people to claim a $500 credit for expenses related to care of elderly relatives. That is down drastically from the $5,000 credit proposed on the campaign trail. Corporations will make out great under the Trump tax plan. Their tax rate will lower to 20 percent from 35 percent. Trump argues that this will boost the economy since it will encourage more people to open businesses and to hire more people. However, few large corporations actually pay the full tax rate since they hire Phoenix tax attorneys to help them find ways around paying those taxes. Many end up passing on the tax costs to shareholders instead of paying it themselves. Yet the plan only lowers taxes for small businesses to 25 percent. Therefore, only the very biggest companies will end up benefitting from the tax cuts under the new plan. Trump promised to make equity funds and others pay their fair share of taxes on profits by increasing that tax rate, but the new plan does not mention it. The tax is known as carried interest, and it is currently taxed at 15 percent instead of the personal income tax rate. The plan would not tax income that businesses earn overseas, and it would give businesses a one-time tax holiday on income they earned overseas in the past. Businesses would not be able to offset their taxes at home with losses experienced overseas. Whenever anything changes with the tax code, there is a possibility that you could file the wrong information, either costing you money or potentially landing you in trouble. The best thing to do is talk with a tax attorney to ensure that you are complying with the new rules. Silver Law PLC can help. 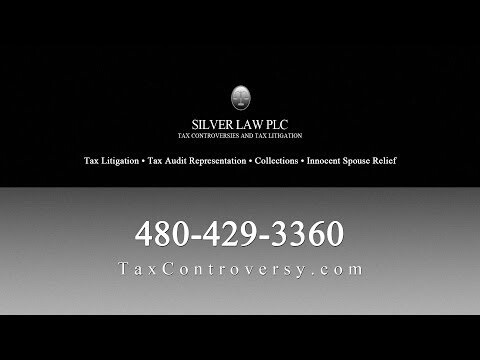 Our tax attorneys in Arizona and IRS tax lawyers in Las Vegas help people and businesses with their tax issues. We help those going through a tax audit, help individuals file for innocent spouse relief, counsel businesses on foreign tax reporting, and more. Call us in Arizona today to learn more about how we can help you manage the Trump tax changes or to talk about your other tax issues.